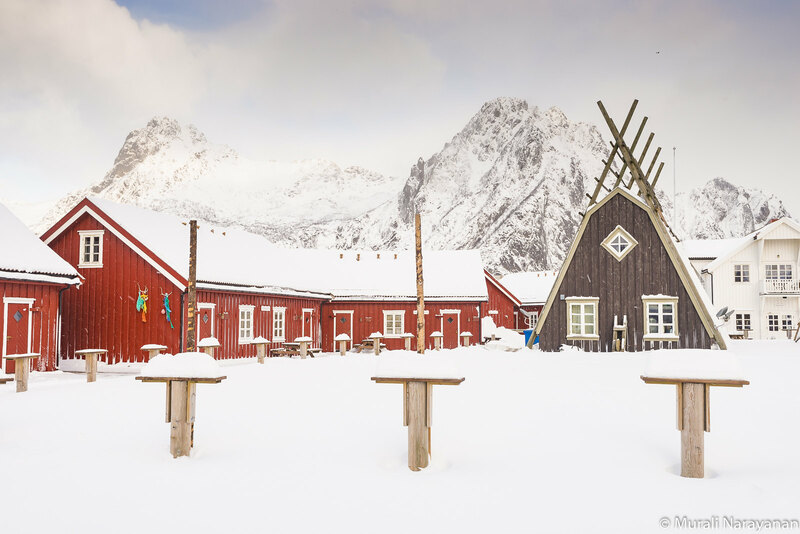 We had our usual breakfast put together by the trio at sunrise, loaded the car and drove to Svolvær, a fishing village with a population of about 5000. Other than the massive fishing industry, tourism is becoming increasingly important. 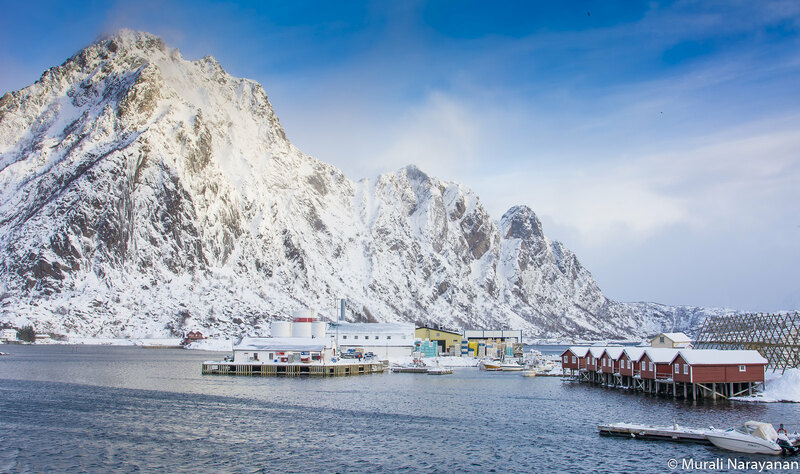 It is also a major transportation hub and favorite starting point for tourists visiting the Lofoten islands. 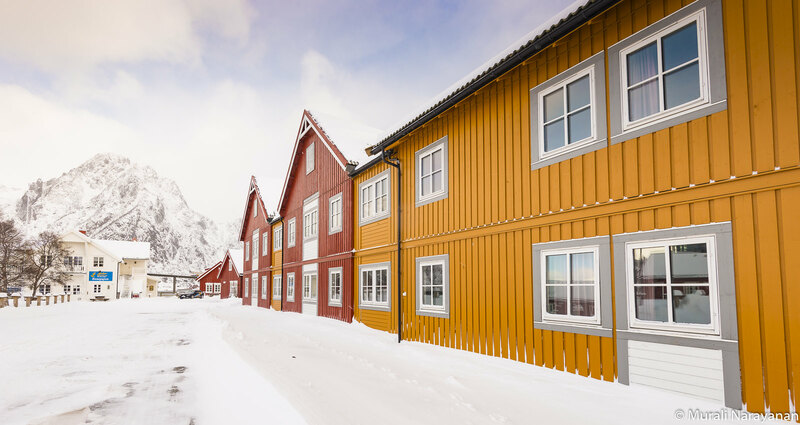 Approximately 200,000 tourists visit Svolvær each year. The weather was partly cloudy and our first stop was near the Svinøya Rorbuer at the end of the bridge. The view of the red fishing cabins and the nearby mountain was spectacular. We then drove back to the town’s center and parked the car in the parking lot of Scandic Svolvær hotel. We walked around the area absorbing the awesome views and capturing some fine images. 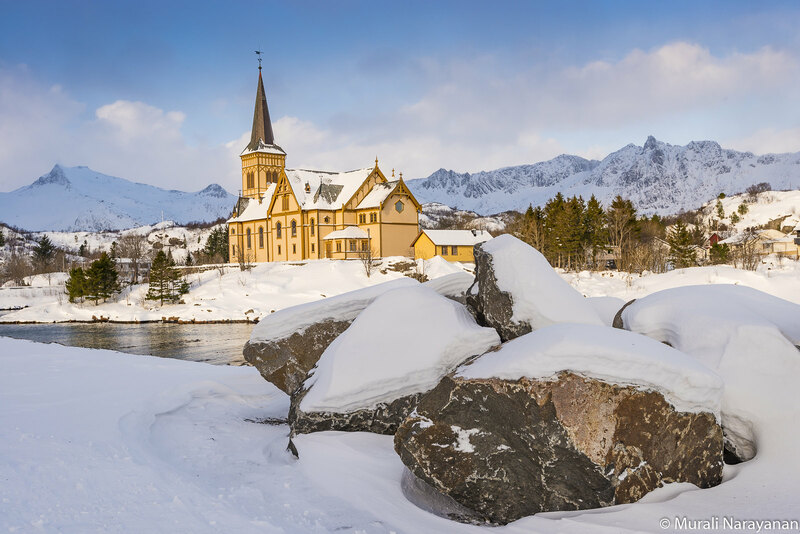 It past 11 when we left Svolvær to get back to Kabelvåg to photograph the Lofotkatedralen (Vågan Church Lofoten). We parked the car beside it and shot a bunch of images of the Church and the rock formations along Kjerkvågen. We then drove all the way back to Leknes and had a very late lunch (or very early dinner) of salad and pizza at Peppes Pizza, pretty much the same we had when we landed in Leknes a week ago. We left Peppes a tad past 5pm and drove to the Stamsund Ferry Terminal and unloaded the stuff. The Hurtigruten ship, MS Nordkapp showed up right on time at 7pm. The ship, built in 1996, has a capacity to carry 622 passengers and 35 cars. It has a total of 458 beds sprawled over 8 decks. The boarding started immediately and was a bit tricky due to snow and ice on the steep ramp. Each of us had to carry 3 pieces of luggage to the check-in area at the end of the ramp. We got two superior rooms on deck 5. The ship left Stamsund exactly at 730pm. The image of our ship below is from the Hurtigruten website. Our rooms had a Queen size bed and a bathroom with a small shower. 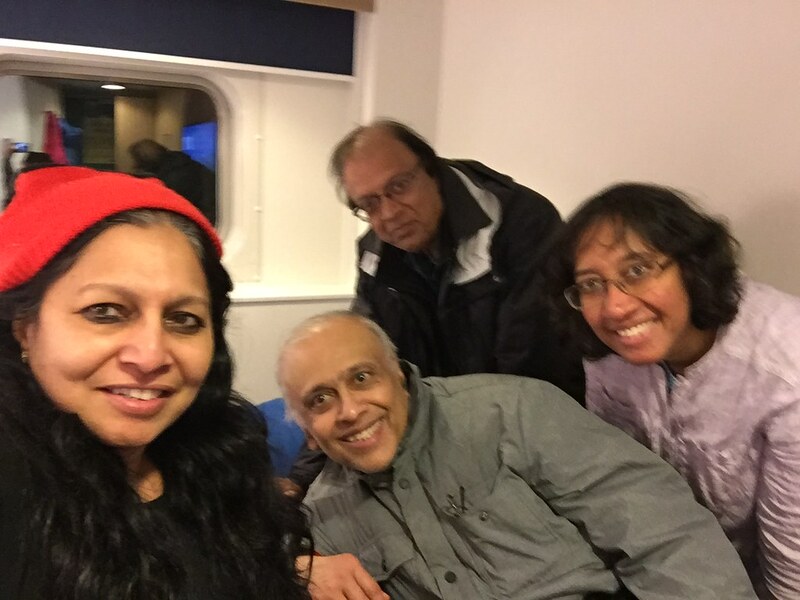 Below is a selfie that Revathy took in her cabin. We settled down. Although we had uninterrupted cell phone coverage all the way until we reached Tromso, Dash decided to purchase Wi-Fi for Revathy. Not sure she used it much as we all went to bed and were busy enjoying the scenery the next morning while the ship was on its merry way to Tromso. As it was snowy and strong cloud cover, we had no opportunity to experience the Northern Lights while on the ship. 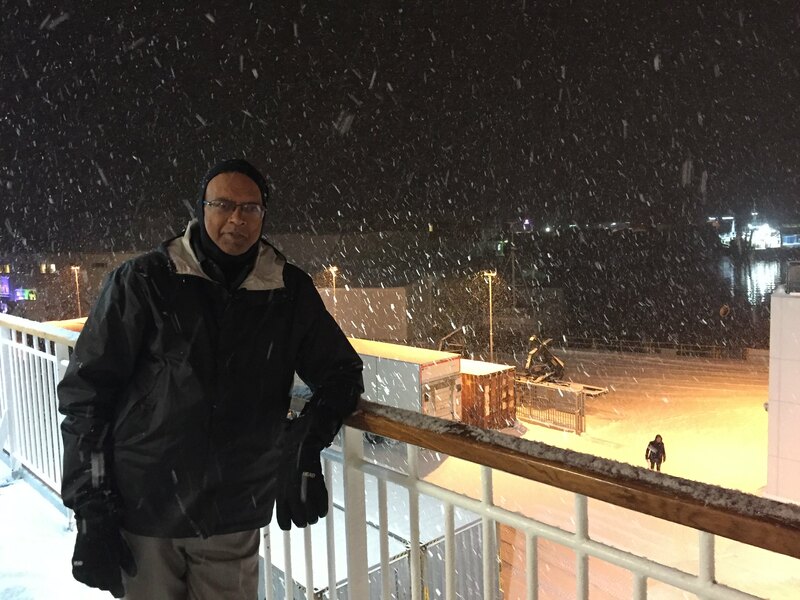 At about 9pm, the ship reached Svolvær and it was snowing heavily. Here is an image of Dash outside near our cabin. We had a shot of Vodka and went to sleep and we woke up the next morning, the ship was arriving at Finnsnes. Great trip and pictures. A trip i’d like to do. Thanks. 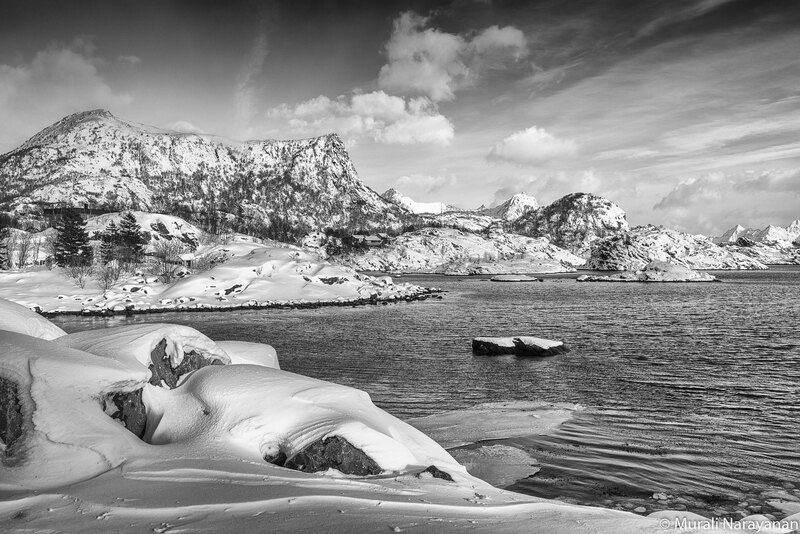 Northern Norway is spectacular especially in the winter. Need to visit in the summer as well.